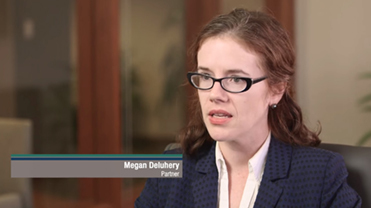 Megan C. Deluhery is a partner at Todd & Weld LLP. Megan concentrates her practice in employment litigation, closely held business disputes, defamation, civil rights litigation, and insurance benefits litigation. She regularly represents clients in federal and state courts and before regulatory bodies. Megan actively engages with clients to comprehensively understand their goals, explore all available strategies and avenues, and develop a plan designed to achieve the most favorable results. Represented 50 percent shareholders/directors in closely held business dispute involving freeze-out allegations, complex privilege matters, and years of contested litigation. Represented majority shareholder in dispute with minority shareholder concerning interpretation of buy-out provision in shareholders' agreement. Regularly represents majority and minority owners in closely held business disputes, including claims of freeze-out, misuse of corporate funds and mismanagement, and disputes regarding shareholder/limited liability company agreements. Represents life insurance companies in connection with disputes with claimants and brokers. Following six days of hearings, obtained arbitration award of substantial contractual severance payment to terminated employee when arbitrator found employee was not properly terminated for cause. Successfully defended against former employer's effort to obtain overly broad injunction against former employee because the client's continued relationships with customers were permissible, as goodwill belonged to client-employee, not former employer. Successfully defended against Elizabeth Grady Salon's effort to shut down competing day spa of former employee, where trial court determined non-competition clause was unenforceable to shut down fomer employee's business and it declined to issue requested preliminary injunction. Elizabeth Grady promptly voluntarily dismissed the lawsuit. See Elizabeth Grady Face First, Inc. v. Garabedian, No. 16799D, 33 Mass. L. Rptr. 324 (March 25, 2016). Represents employers and employees in administrative and court proceedings involving discrimination, wage act, and non-competition and non-solicitation disputes. Obtained jury verdict for defamation plaintiff against Boston Herald following three-week jury trial, resulting in payment of over $900,000 in damages and interest to client, after defeating two motions for summary judgment and obtaining names of confidential sources. Marinova v. The Boston Herald, Suffolk Superior Court, Civil Action No. 10-1316; see WL 7637805 (Mass. Super. Ct. Aug. 3, 2016) (memorandum and order denying defendant's post-verdict motions); "Woman awarded $563,092 in Herald defamation suit," The Boston Globe, March 20, 2014. Represented Bill Cosby accuser, Kristina Ruehli, in defamation suit filed in U.S. District Court for the District of Massachusetts. Successfully defeated motion to dismiss and obtained evidence from third-party witness to substantiate Ms. Ruehli's contemporaneous account of the attempted sexual assault by Mr. Cosby. Obtained federal jury verdict in favor of a male student and his family for breach of contract, judicial order for temporary reinstatement and consent order for permanent reinstatement against a private preparatory school based on its mishandling of a disciplinary matter involving alleged sexual assault. The jury verdict came three months after the expulsion of the student. The case is the first known jury verdict in favor of an improperly expelled male student in the country since the 2011 guidance from the Department of Education. Defeated a request by Amherst College to dismiss the case of an expelled male student who asserts claims for breach of the student handbook and violations of Title IX based on the school's biased and flawed disciplinary process related to a female student's allegations against him of sexual misconduct. The case involves allegations that the school’s disciplinary process failed to uncover evidence favorable to the male student, and that the male student was incapacitated at the time of the sexual interaction such that he was incapable of committing the offense for which he was expelled. Represents students expelled from colleges/universities and private secondary schools for alleged violations of sexual assault/harassment policies and/or Title IX. Obtained favorable summary judgment ruling on behalf of anti-poverty organization asserting civil rights and defamation claims against municipality and town officials. See SMOC v. Framingham, 752 F. Supp. 2d 85 (D. Mass. 2010). Represented Islamic Society of Boston in case against Boston Herald and related parties asserting defamation and civil rights claims in defense of ISB's efforts to build new mosque in Roxbury neighborhood of Boston. Obtained preliminary injunction on behalf of regional bank that alleged a large national bank's proposed new trademark infringed on the regional bank's mark, resulting in successful resolution of case for client. See Commerce Bank & Trust Co. v. TD Banknorth, Inc., 554 F. Supp. 2d 77 (D. Mass. 2008). Persuaded the Massachusetts Supreme Judicial Court to reverse summary judgment on a multi-million dollar quantum meruit claim of her client related to a construction project. The court established new law by ruling that intentional breach of a construction contract does not prohibit pursuit of a quantum meruit claim. (G4S Technology LLC v. Massachusetts Technology Park Corp., --- Mass. --- (2018)). Persuaded the Massachusetts Supreme Judicial Court to overturn summary judgment for a law firm and grant summary judgment to her client which had sued for legal malpractice. In so doing, the SJC for the first time ruled that a judicial error of law does not bar recovery in a legal malpractice case where the defendant law firm was negligent in failing to prevent or mitigate the legal error. (Kiribati Seafood Co., LLC v. Dechert LLP, 478 Mass. 111 (2017). Obtained landmark ruling concerning discoverability of attorney-client communications by members of the board of directors of closely-held company. See Chambers v. Gold Medal Bakery, Inc., 464 Mass. 383 (2013). Acted as appellate counsel in cases where the firm was not trial counsel, including matters involving complex commercial litigation and novel issues of law. Successfully defended national law firm against allegations that firm attorneys had obtained confirmation of a knowingly defective Chapter 11 bankruptcy plan. See In re High Voltage Eng'g Corp., 360 B.R. 369 (D. Mass (Bank.) 2007). Megan serves on the Board of Directors for the Transformative Culture Project, a non-profit organization empowering youth in Boston and across the Commonwealth of Massachusetts through education, employment, and opportunities for creative expression. During law school, Megan worked in the Mandel Legal Aid Clinic's juvenile justice program, where her team submitted a well-received amicus brief to the Illinois Supreme Court arguing a mandatory life sentence for a 15-year-old accessory to a gang-related double homicide was unconstitutional. See Illinois v. Miller, 781 N.E.2d 300 (Ill. 2002). "Plaintiff's status is germane to any defamation case," Massachusetts Lawyers Weekly, July 17, 2014.